Our national survey of 350 executives shows a strong correlation between company size and progress along the path to cloud migration. 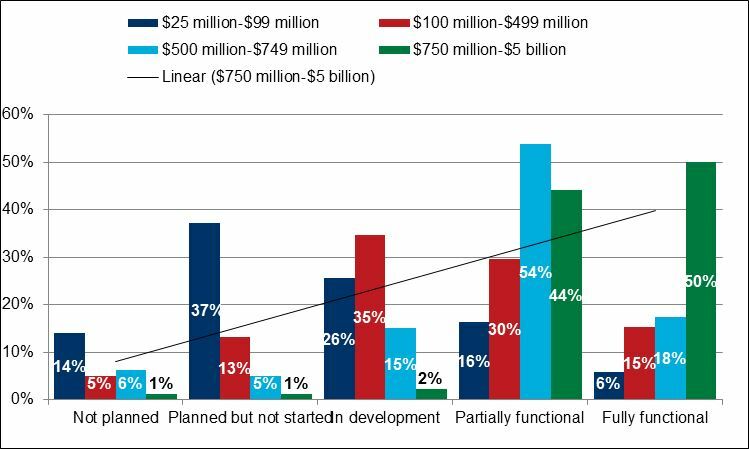 As you can see in the chart below, just over one-fifth of total respondents are fully functional in the cloud, yet half of the largest companies surveyed (those with revenues of $750 million – $5 billion) have reached this milestone. Meanwhile, over one-third of small companies ($25 million – $99 million) have planned but not started a cloud migration. These companies have a lot to gain from cloud’s scalability, low price, and functionality, but in order to match larger companies’ cloud functionality, they have a lot of catching up to do. Q16. To what extent does your organization currently employ cloud and managed services? In our next post, we’ll see what functions companies are moving into the cloud. This entry was posted in Research and Reports and tagged cloud, Migration, results, survey by Ben Wright. Bookmark the permalink.